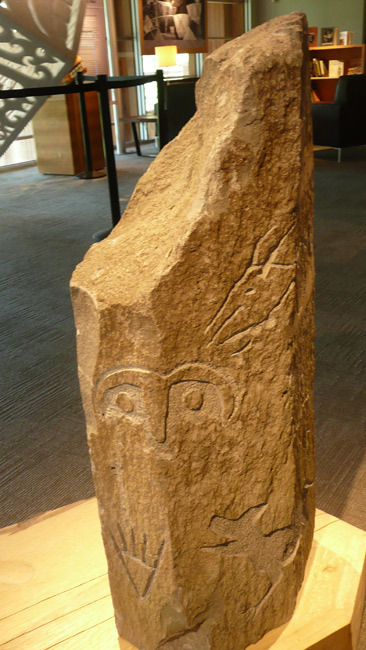 You are browsing the Blog for Rock Art & Archaeology Archives - Marja-Leena Rathje. Xwalacktun (Rick Harry) is a well-known and recognized and very prolific First Nations artist who studied in Emily Carr College of Art and Capilano College in Greater Vancouver. 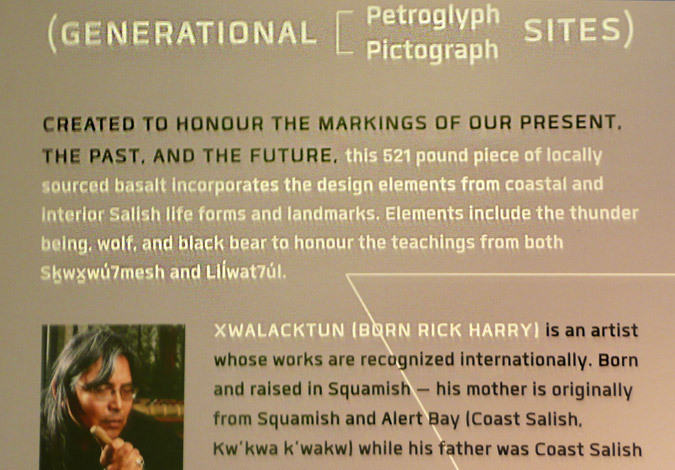 Recently I was excited to see one of his latest works, a petroglyph called GENERATIONAL Pictograph Petroglyph SITES at the Squamish Lil’Wat Cultural Center in Whistler. 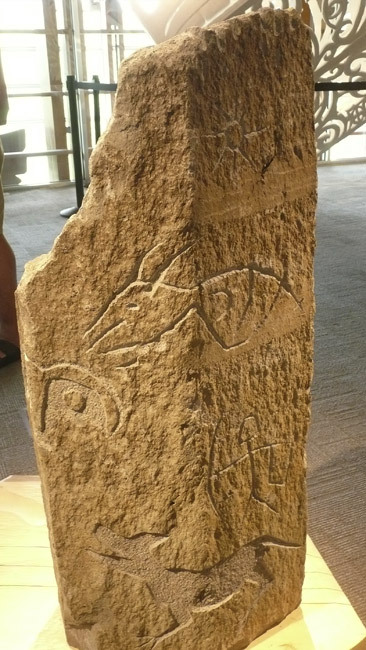 As I have long been fascinated by ancient petroglyphs, this modern one intrigued me greatly. I love it! 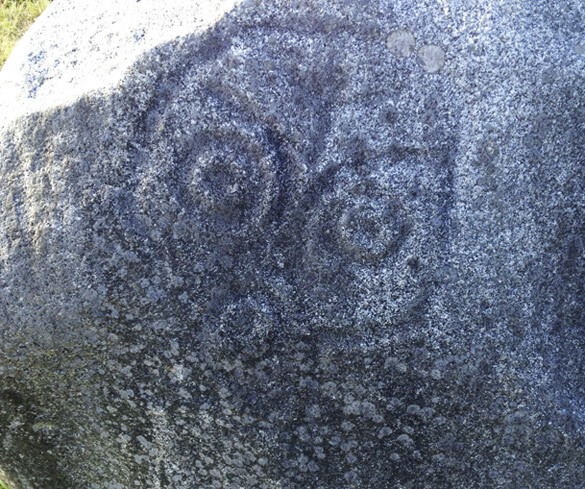 possibly a petroglyph on Hornby Island? One reason we stayed at Campbell River the first night of our island hopping holiday was that we wanted to visit Quadra Island, a short ferry ride away. 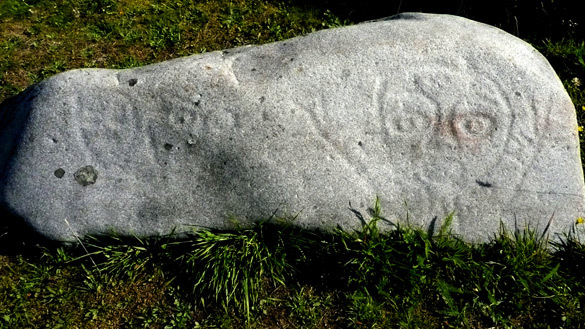 Some years ago when I was researching rock art around British Columbia, I had come across and written about Spirit in the Stone, a marvelous book by Joy Inglis, about the numerous First Nations petroglyphs on Quadra Island. 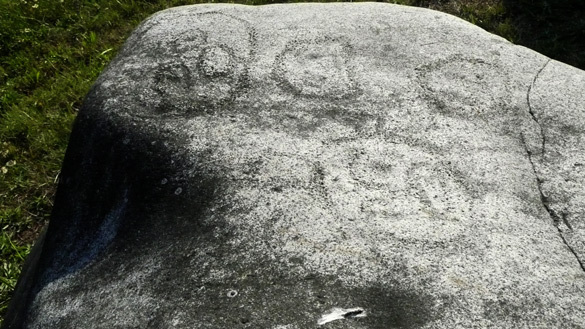 It had been a longtime dream of mine to visit this island and its rock art, some about 3000 years old. Our focus was to visit the museum and to see some of those stones that had been placed nearby. Photographing these were a challenge for the light was already too high and bright, so there was much processing needed, these ones being the best I could do. 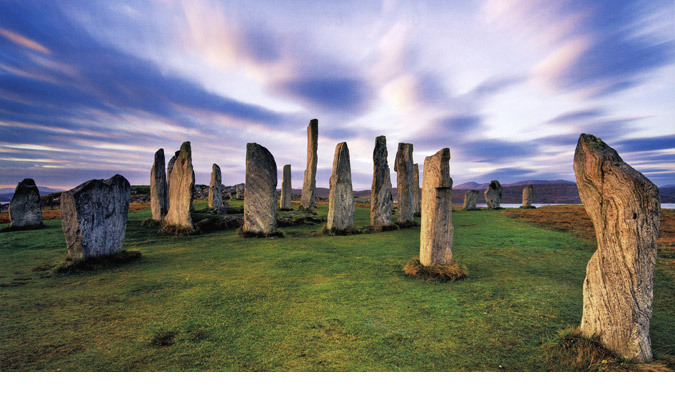 We did not have time to explore the whole island and visit other stones but hope to revisit again another time. 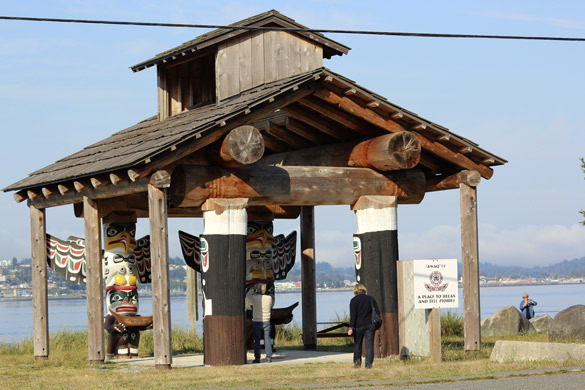 The top photo shows Ah-Wah-Qwa-Dzas, a gathering place on the shore in front of the museum. You can see Campbell River on the other side. We admired the displays inside the museum called the Nuyumbalees Cultural Centre – the numerous masks and other fine arts and crafts, a longboat, many photos of the old longhouses and much about the early history and impacts (many quite devastating such as several deadly smallpox epidemics) of white man’s arrival to these coastal communities. I think our German visitors found it all enlightening and sometimes quite shocking. No photos were allowed. Please do read the museum’s interesting website for more information. 1. Lascaux’s Picassos – What prehistoric art tells us about the evolution of the human brain. A gorgeous slide show and many great links on a favourite subject of mine, and something I’ve written about a few times before. 2. Cuts that heal: Barbara Hepworth’s hospital drawings. I love her sculpture. Now seeing her fantastic drawings in the provided slide show puts her in the class of the Renaissance artists in my book! The second work Concentration of Hands II is my favourite. I had many of the same thoughts as Jonathan Jones mentions in his review (link on the side). How I wish I could go see this exhibition. Just in time for Halloween, Canada’s most decorated literary doyenne – Margaret Atwood – has co-written a serialized zombie novel with a promising British author that will be posted chapter by chapter at the Canadian-based story-sharing website Wattpad. I’m not into zombies but curiousity sent me to check out Wattpad and The Happy Zombie Sunrise Home where the first three parts are up. I read, I laughed, I will be back. Prehistoric cave artists used cartoon-like techniques to give the impression that their images were moving across cave walls, two French researchers have suggested. 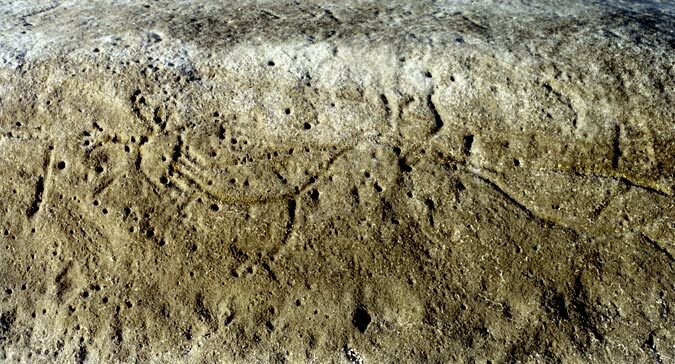 A new study of cave art across France – in which animals appear to have multiple limbs, heads and tails – has found that the paintings are actually primitive attempts at animation. When the images are viewed under the unsteady light of flickering flames the images can appear to move as the animals they represent do, the research claims. 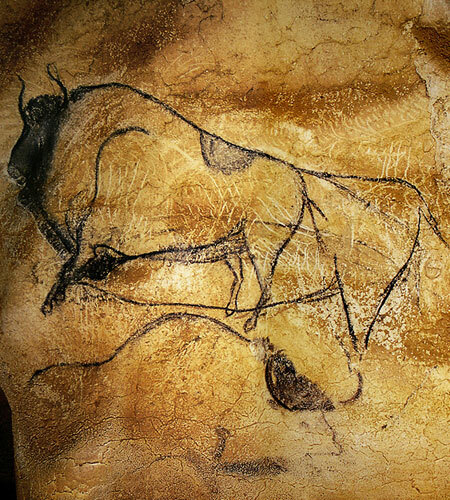 Mr Azéma, after 20 years researching Stone Age animation techniques, has identified 53 paintings in 12 French caves which superimpose two or more images to apparently represent movement. More at Daily Mail, UK. The animations created by archaeologist Marc Azéma show how the paintings might look to our eye in the flickering fires in those very ancient caves. This study makes me recall Werner Herzog’s film Cave of Forgotten Dreams. (The image above is reposted from that blog entry but is not necessarily identified by M. Azéma as an example.) Also my beloved Earth’s Children series of books by Jean M. Auel. Her last book especially has vividly described scenes of paintings being created in the caves, as well as the sacred rituals taking place in them in flickering firelight and in darkness. Kiitos, thanks to Finnish author and blog friend Anna Amnell for her post on this, one of my favourite themes on my blog. As Anna said, the more we learn about these early humans, the more we are amazed by their intelligence and creativity. Long-time blog friend Lucy of Box Elder writes wonderful posts from her home in Brittany. I love her rambling stories and gorgeous photos of her garden and the world she lives in, of forays to explore many interesting towns and historical sites. They touch something deep in me, a love for the ancient, the traces of the past, the weathering actions of time and nature. Maybe it’s because I live in such a young city and province in the New World. Today Lucy wrote about her visit to Château de la Hunaudaye, a medieval fortress that has been restored. This inspired me to pull out a photo album from May and June 2002, from a trip to Vaasa, Finland. Two artist friends and I had an exhibition of our prints there, in fact called Traces. We spent several days in Vaasa hanging our exhibition, having a meeting with the press, visiting family, printmakers and exploring the city and surrounds. All culminating in the opening of course. 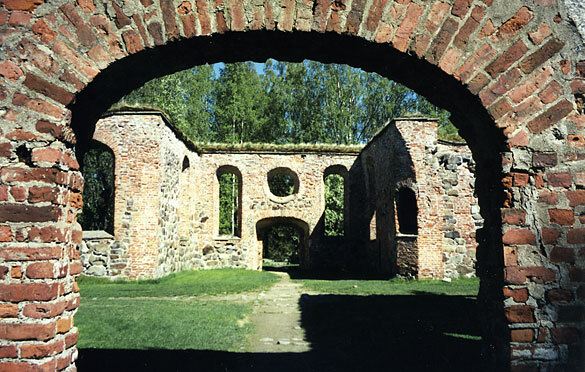 One interesting place we visited was Old Vaasa, at the site of the original city that had burned down, and its ruins of St. Maria Church. Sadly my photographs are not good – here’s a better photo. Like the Château, these ruins had also been restored in part, minus the roof. Lucy lamented how restorations sometimes destroy the character of the original, something I’d agree with from my comparatively limited exposure. Much as I liked these simple church ruins and commend that it was done, it lacked some of that very old, crumbling, decaying quality. It is a quandary indeed, to restore or not and to do it sensitively, to save our history or not. I keep thinking about my deep fascination for my own origins, of the origins of the Finno-Ugrics, and of all humans. 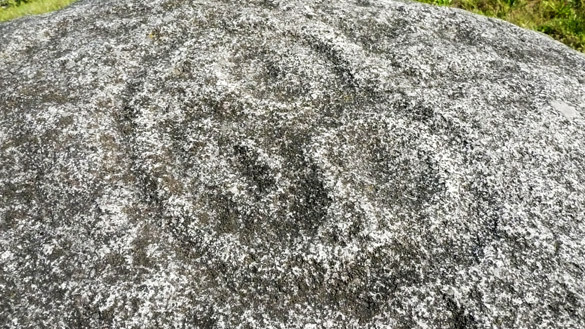 I’m understanding more and more that this is at the very root of my fascination and passion for the traces left behind by these early people on rocks and cave walls, in their sculptures, standing stones, dolmens, pottery, jewelry and so on. And this passion naturally translates into my own art work. Casually browsing through some of my archives, I came across this almost forgotten post from 2007 which really resonates for me at this moment, especially the above passage. Back at the printmaking studio after several months’ absence, I am revisiting the last prints I finished, especially the FRAGMENTS pieces. 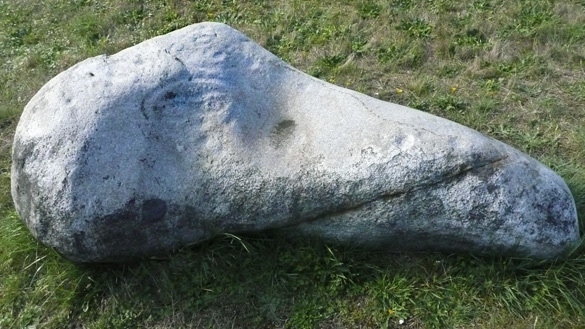 I am gathering thoughts, ideas, feelings along with possible relevant images from my massive files as I plan new work. It is a process I need to go through, a kind of evaluation of past work and finding the connecting threads to carry forth as I move into the new. UPDATE Sept.23rd, 2011: The Fragments category is now up under Printworks. I will add more works as they are created and completed. Thanks to Marly for the question in the comments, it has spurred me on to remind my designer daughter to help add that category at long last. 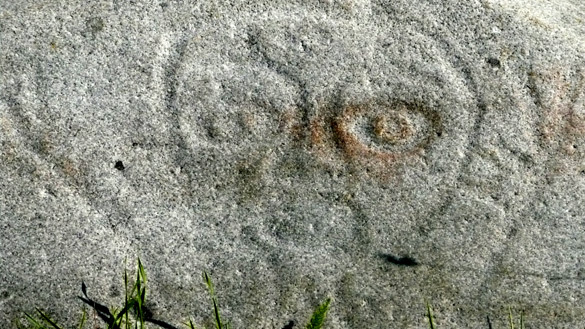 As most long time readers of my blog know, I am fascinated by ancient pictographs, petroglyphs and other art forms. They have been an inspiration in my own artmaking for over a decade. So, I was thrilled yesterday to finally see Werner Herzog’s 3D documentary film Cave of Forgotten Dreams. It was as amazing and awe-inspiring as I had expected it to be from the many reviews I had read. I have previously seen gorgeous photos of the paintings in Chauvet Cave in books and on France’s Culture Commission’s online site, but seeing this film just blew me away. These early humans of so long ago were incredibly skilled artists. The 3D glasses bothered me a little at first especially in scenes with a lot of movement, but it did not take long to adjust. They really did enhance the experience of the caves’ architecture and how the paintings of the various animals flowed with depth and movement along the curving walls. The discussions by Werner Herzog and the scientists were informative and enjoyable and made me wish I had been able to record some of them. If this film ever comes out as a DVD, I want it! ….glide through the cathedral-like cave, over cave formations and sloping passageways, across the beautiful 32,000 year old drawings. These scenes are interspersed by interviews with scientists musing on the cave’s mysterious beauty, the evolution of creativity and the nature of humanity. Operatic, gorgeously accomplished and truly unforgettable: this is an extraordinary glimpse at, perhaps, the dawn of art itself. The story about the hand print on the snowblower keeps getting more interesting. If you have not already read that post and the comments especially from Richard and my reply, may I suggest doing so, then come back here. Since you missed them when you photographed the hand print, here are the other decorations on the Park City snowblower, replicating petroglyphs like the ones we saw in Moab, which Richard says are all over the red rock mesas of eastern Utah. I particularly like the turtle and the bison. 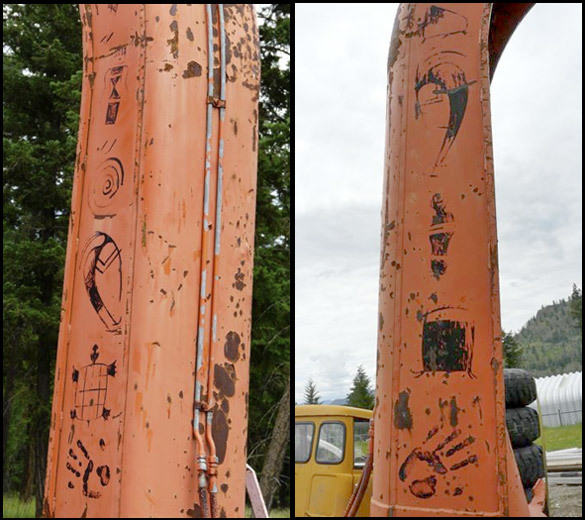 The bison, below, and the above right photo are the side of the chute that you photographed (both sides have a hand print), and it’s definitely harder to make out the drawings with all the rust on that side. 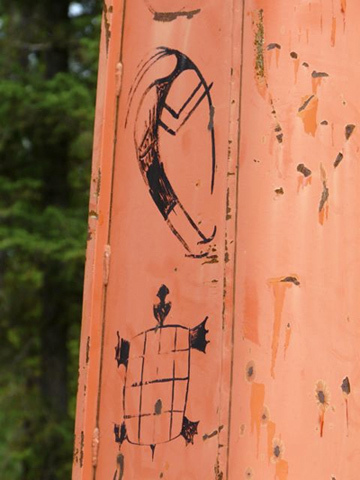 Not graffiti, either – Richard said someone would have decorated the chute intentionally when it was first put into operation. Pretty cool. I had not realized that Richard was not joking when he wrote about them on my blog. 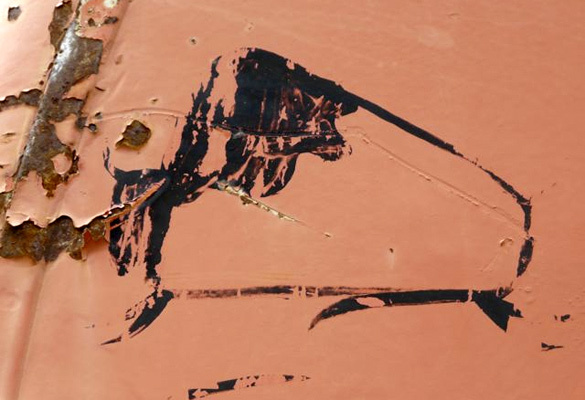 Are the images ‘painted’ (pictographic), or scratched or carved deeply into the metal (petroglyphic)? I’m sorry I missed them. I love the Kokopelli figure! They are painted rather than carved. 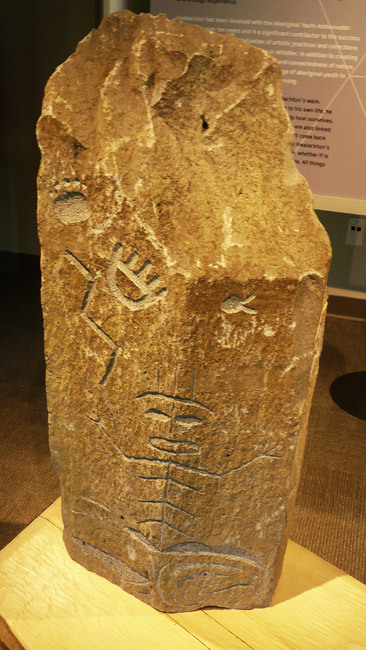 They are copies of petroglyphs, and yes, the figure is similar to the one called Kokopelli that is so popular in Moab and other areas. Richard had to chuckle when he heard you thought he was joking! But then you hadn’t seen the more clearly painted side of the snowblower chute. Neither had I, and it’s been sitting there for a year. What a story, eh! And goes to show that even my eagle eyes and camera don’t always see everything! Thanks for sharing these photos and stories, Anita and Richard, and I hope you hang on to these images.